Gunite, simply put, is a mixture of cement, sand, and water. This produces a wet, concrete-like material that is reinforced by rebar. Once you and your pool contractor settle on the design of your new pool, a hole is dug, plumbing is placed, and the framework grid of steel rebar is assembled. Once the grid is in place and secured, the gunite is sprayed over the framework, then troweled smooth. After a period of time, typically two weeks, the new surface is smoothed. Other aesthetic features like tile, or exposed aggregate can be incorporated with the gunite as well. 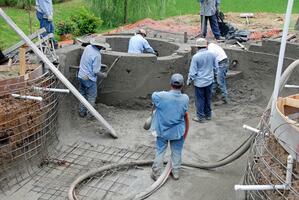 Gunite pools can be built in any shape or size, and are very durable. The design possibilities with this type of pool construction are virtually limitless. Fiberglass pools are prefabricated, come in a single piece, and are dropped into an appropriately dug hole. This leaves you with something you can only pick from a catalog, or “off the shelf”. The lifetime for a liner pool is 8-12 years, and the expense of replacing a damaged or torn liner can run into the thousands. For a true custom pool that will require little structural maintenance, and offer enhanced durability, gunite offers the flexibility and strength that you want. Lucas Firmin Pools designs and builds custom gunite pools in the Baton Rouge area.